The Third Tribe Artist Interviews feature a mix of creative, yet very business minded artists. Artists like this are worth getting to know. In this series of artist interviews I hope to introduce you to some fascinating people and give you a glimpse at what it’s like to be an artist, which is a tough call since no two artists have the same experience. Enjoy! This week I had the pleasure of talking with a man who sees scale as an opportunity for adventure. Robert Schott’s murals make walls come alive for clients all over the world. What I liked most about talking to Bob (via email) is his directness. His biography is a beautiful example of an economy of words. It’s entertaining and down to earth. I can’t introduce him nearly as well as he introduces himself. Curious yet? You can read his bio here. I am a self taught artist who continually tries to teach myself new ways of creating. Not afraid to say I can do something and then try to figure it out afterward. Quite simply my mission is to create the best artwork I can on a daily basis regardless of the time and effort it takes to get that done. 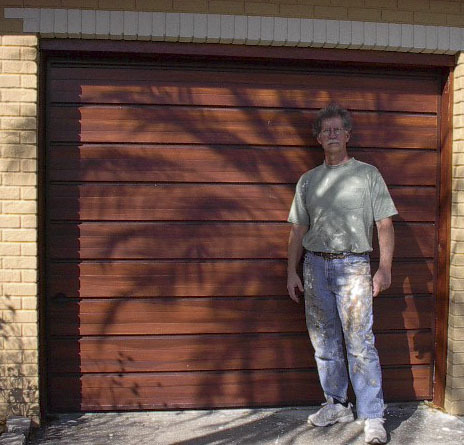 This a picture of Robert in his paint clothes standing in front of a metal garage door he painted to look like wood. Actually I would say my art career has been divided into two major periods. The first period lasted 20 years. During that time 95% of my artwork focused on painting large Florida wading birds in their natural settings. I did not paint in a traditional wildlife way, my work was more stylized and contemporary. I sold my work in art shows and galleries. The second period started when I decided to stop exhibiting in art shows and focus on creating murals and faux finishes. This period has been 11 years to date. It is a much bigger challenge in the sense that one project will be a detailed mural and the very next one a Venetian plaster project. There is no time to get comfortable creating which is a good thing. What is it like to paint so large? What do you love about creating murals? One challenge to painting large areas is the simple logistics of getting the image large enough to fill the space. I think most artists would agree that when working on a piece is nice to able to get back a distance from it and see how it looks from there. When working on a canvas at my painting table I frequently get back 10-12 feet to look at it from there. It really helps to see the piece all at once so to speak. But working on large murals often times getting back involves climbing down from scaffolding to get the best ‘look’. So working large presents its own challenges but there is just something about working very large that is exciting to me and I have no idea why that is. 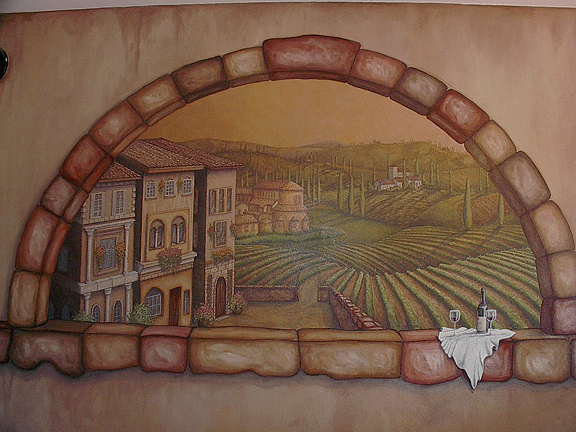 The picture of the arch with the Tuscany mural is the last mural project I completed a couple of weeks ago. More pictures of that here. My work now is on a commission basis, the client usually has specific ideas of what they want. So after consulting with a client we work out a plan to get there. There is a distinct difference between now and the first period of my art career. For the first 20 years I painted what I wanted. I was drawn to the elegant natural beauty of Florida and created artwork in my own style depicting that natural beauty. Now it’s actually a bigger challenge creatively speaking. 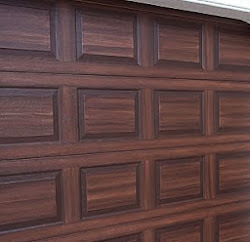 On a commission basis there are guidelines and boundaries set by the client which need to be taken into consideration. My work, for whatever reason, seems to be uplifting. It’s not something I consciously try to do but clients repeatedly make comments about my work to that effect. I imagine you do a lot if not all of your work on site for your clients. What is your favorite thing about your changing workspaces? The challenge of it all, it is never boring. I think it keeps me on my feet so to speak and totally engaged creatively and intellectually. It can be such a real pleasure to met so many people and actually get to know them as most projects take a week or longer. 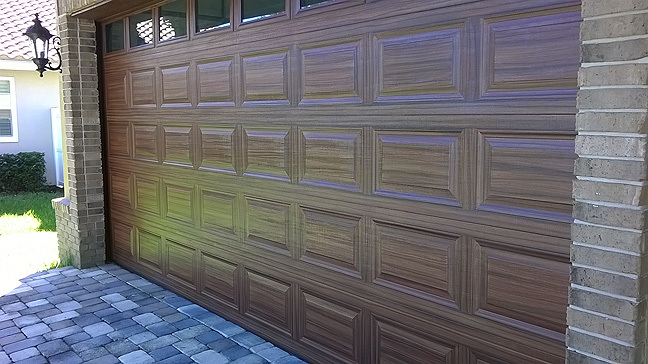 It is a very gratifying business this business of beautifying a home. I am constantly humbled that I can bring such enjoyment into others lives by creating a more beautiful environment for them to live in. What would you say makes your work unique? Here’s the thing about that question, I make my work unique. Every artist has their own style and in my case, as I suspect with most artists, I never set out to develop a certain style. I create artwork and the artwork that comes out has a style to it that is my own. I think that is what happens when you create work without trying to emulate this artist or that artist. I never think about creating in one style or another, I just create it and it therefore the work has its own uniqueness to it. What habit or practice has been the most valuable to you, your life or your art career? Taking responsibility for myself and my actions has been the most valuable lesson I have ever learned. Both as it applies to my personal life and art career. When you take responsibility for yourself you take charge of your career and life. It’s up to you to make things happen. The second and equally valuable practice is to work hard at what you do. Don’t be afraid to work hard and long at what you do. It’s going to sound a little flippant but the most challenging project is always the last one. That’s because virtually every project is new and different. 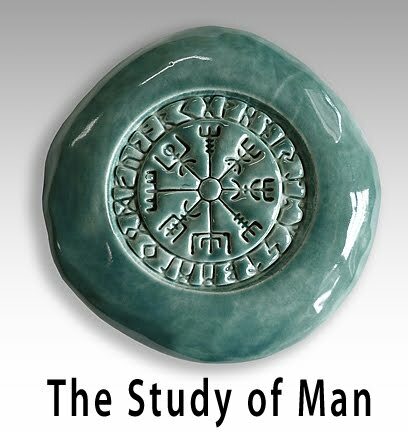 I am working on a project now that in many respects is unlike any I have ever done. It is a mural for a new restaurant with an aviation theme. The space I have to create this mural is 4 feet high and 150 feet long and the client would like to include images from the Wright Brothers first plane to the Space Shuttle without it being a linear timeline type of thing. My wife, Cathy, is an artist also. She is without a doubt the most creative person I have met. I am constantly inspired by her work. Who would you most like to meet and what would you like to learn from that person? There is this mural artist, John Pugh, who creates these incredible 3D murals on a very large scale. His work is often times 60 or 70 feet wide and 50 feet high. I mean really big stuff. It would be great to sit and chat with him for a while. Are you BOB SCHOTT from Northeast High School that studied under Henry Fink? Yes, that is me. Go Vikings.